If you have been struggling to find a way to make this valentine day unique and special, Uber has come to your rescue. 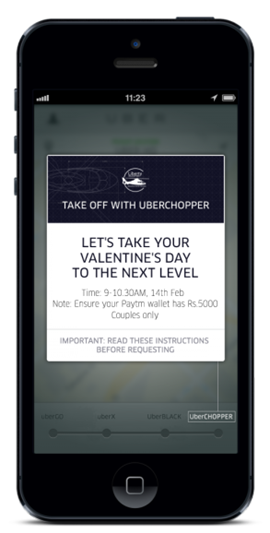 Technology based transport company – Uber is offering chopper rides for couples this valentine day, in an attractive package which adds up to 5,000 INR, you would have to pay via Paytm wallet. Uber has partnered with EuroCopter and Asian Haus to deliver this valentine day package which includes, Door-to-door UberBLACK pickup, 20 minutes of chopper ride for 2 and Pool side brunch by Asian Haus. The service will run between 9 to 10:30 AM, so yeah, this could be a good early start to your valentine day. An UberBLACK will pick you up along with your date, and transport you to the helipad. After the chopper ride, you will be transported to your romantic lunch location. Your entire date will last for 4 to 5 hours. You can proceed by selecting #UberCHOPPER in the Uber app. Then Press the black bar that reads “Set Pickup Location”. If you have minimum 5000 INR in your Paytm wallet, press the request button at the bottom of the screen. You will receive a phone call confirming your date. Since its likely that most couples are exhausted brainstorming trying to make this Valentine day special, you will need to hurry up to ensure your chances.